Note: You can find On Point's clarification on Sen. Amy Klobuchar's record in Minnesota here. Bernie Sanders announces his 2020 bid. Plus, a close look at Amy Klobuchar’s path to becoming a 2020 presidential candidate, from her Minnesota roots, to her prosecutorial career, and then to the Senate. New York Times: "Amy Klobuchar Casts Herself as Heartland Democrat in First Campaign Swing" — "Amy Klobuchar cast herself as the candidate from the heartland Saturday in the first campaign trip of her presidential run, visiting a state Hillary Clinton narrowly lost in 2016 and emphasizing her deep Midwestern roots, her knowledge of rural America and her record of bipartisanship while drawing sharp contrasts to President Trump on issues from climate change to immigration. "Ms. Klobuchar pointedly chose Wisconsin — the state that Mrs. Clinton did not visit during the general election campaign in 2016 and lost to Mr. Trump by less than one percentage point. The Wisconsin defeat, along with narrow losses in Michigan and Pennsylvania, clinched the election for President Trump and inflicted a devastating wound that still haunts Democrats in Wisconsin and beyond. "In an already crowded Democratic primary field, Ms. Klobuchar was eager to highlight what her campaign hopes can set her apart: her Midwestern base and her electoral dominance in many rural, red counties in Minnesota populated by the kind of voters who have largely deserted the Democratic Party. She campaigned in Iowa later in the day." MinnPost: "Klobuchar for president? She’ll face enormous obstacles" — "More than likely, Amy Klobuchar will announce on Sunday that she is running for president. As Minnesota’s most popular elected official, winning her last U.S. Senate campaign with 60 percent of the popular vote, everyone in the state thinks her presidential prospects are terrific. But while it will not be popular here to say this, her prospects of being a successful candidate are against her; contrary to received wisdom in Minnesota, she faces enormous obstacles either as a presidential or vice presidential candidate. "There are many problems Klobuchar confronts as a presidential candidate, some unique to her, some related to coming from Minnesota, some given the direction of the Democratic Party — and in many ways all three of these factors are connected. "Consider first Klobuchar as candidate. Yes, she is well known in Minnesota, but nationally she is still barely a blip in public opinion polls. A recent Washington Post poll among Democrats gave her only 2 percent support. Other polls have given her barely 1 percent. Outside of Minnesota she remains largely unknown. Part of the problem is that Klobuchar comes from the Midwest – flyover zone for those on the coasts – outside of the major media markets where candidates such as Sens. Cory Booker, Kamala Harris, and Elizabeth Warren come from. They simply have higher name recognition given their states. This geographic isolation of Minnesota has historically been a challenge for Minnesota presidential candidates." Huffington Post: "Sen. Amy Klobuchar’s Mistreatment Of Staff Scared Off Candidates To Manage Her Presidential Bid" — "At least three people have withdrawn from consideration to lead Sen. Amy Klobuchar’s nascent 2020 presidential campaign — and done so in part because of the Minnesota Democrat’s history of mistreating her staff, HuffPost has learned. 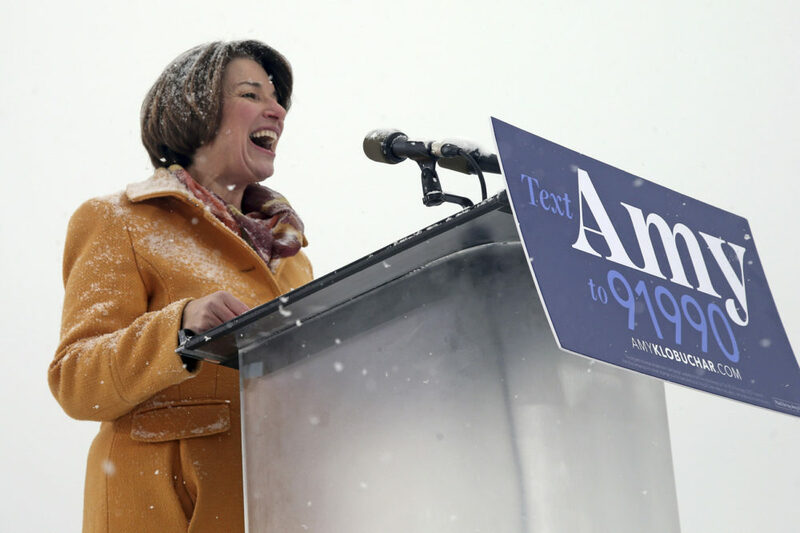 "Klobuchar, who plans to make an announcement about a potential presidential bid on Sunday in Minneapolis, has spent the past several months positioning herself to run for president. She’s beloved in her state as a smart, funny and personable lawmaker and has gained national attention for her lines of questioning at high-profile hearings. "But some former Klobuchar staffers, all of whom spoke to HuffPost on condition of anonymity, describe Klobuchar as habitually demeaning and prone to bursts of cruelty that make it difficult to work in her office for long." This program aired on February 19, 2019.